1 June / At 12.00 on Friday, 1 June, a new playground will open in Jaamamõisa, on the plot at Lääne Str. 11a. According to Tartu Mayor Urmas Klaas, Tartu has a tradition of opening a new playground each year on Child Protection Day. The new playground in Jaamamõisa has a playful and exciting outdoor area designed for children, with plenty of activities to keep children of all ages busy. Different land formations have been created, onto which playground features have been installed and secure areas built. Children will be able to play on a five seat swing, a teeter-totter and spring swings, on carousels, in a playhouse, and on a diverse climbing attraction. Games have been drawn on the playground’s pavement, and smaller children will have their very own basketball wall, complete with low hoops, on which to enjoy their very first practices. The main attraction at the brightly coloured playground is the unique trampoline on a hill. The playground also has bicycle stands, benches and litter bins, with new lighting and landscaping having been created. Over the coming weeks, uniquely shaped planting boxes will also be added, in which herbs will be planted. The playground was designed by OÜ Kino Maastikuarhitektid, who took into consideration the wishes and suggestions of the people living in the vicinity. 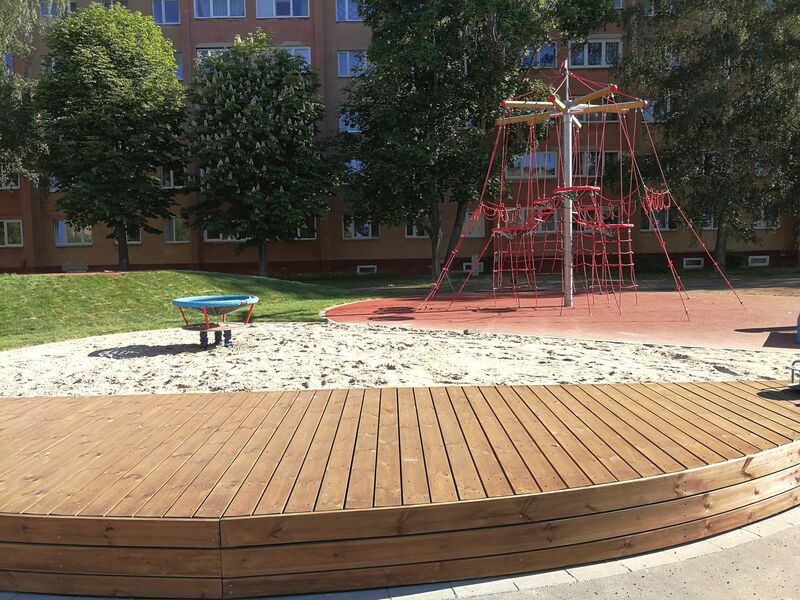 The playground was built by OÜ Kivipartner, supervision was provided by Lacados OÜ and landscaping created by OÜ Roheline Ruum. The playground cost EUR 247,682.